A rustic-yet-chic wine bar and shop in Santa Barbara's Funk Zone. : Trips to Paris and Burgundy inspired master sommelier Brian McClintic's wine bar concept in the Funk Zone neighborhood of Santa Barbara. The recent development of this eclectic community comes courtesy of Sherry Villanueva, who is also behind The Lark and Lucky Penny. 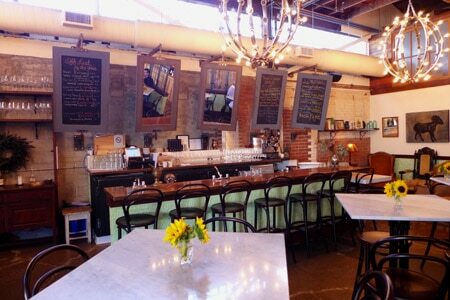 Les Marchands Wine Bar & Merchant presents exposed wooden trusses and other rustic furnishings. As you walk in you'll see the wine shop with its shelves loaded with bottles. On the left is the bar and dining area populated with regular and high-top tables. Select from small plates like a charcuterie plate, cheeseboard with accoutrements, pickled vegetables from the farmers' market, and a croque madame (ham and Gruyère sandwich topped with a fried egg). There are also a few nightly specials such as "Brats & Brews" on Wednesdays and "Pasta Night" on Sundays. The selection of beers highlights offerings from Belgium and Germany. About two dozen wines are available by the glass, plus more on the "off list" chalkboard. Wineries from France, Italy, Austria and Switzerland are represented, along with very small producers from the Santa Ynez Valley. We also noticed a trend of featuring wines with low alcohol percentages.